"New wine will drip from the mountains and all the hills will flow." 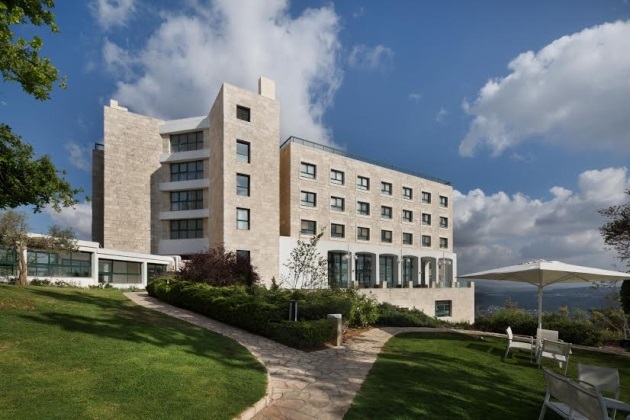 (Amos 9:13)" Yearim Hotel sits atop one of the highest peaks in the Jerusalem hills, fully immersed in nature's charms. Your stay will take you on a journey through history to the most pure, unchanging corners found in Israel. "During your stay, you will travel through history to the most pure, unchanging corners found in Israel." The hotel upholds a fine balance between past and present and is thoughtfully designed to connect people to nature and body to soul. This is combined with first-class service to create a deep-rooted historic experience that inspires serenity and awakens nostalgia for Israel's yesteryear. 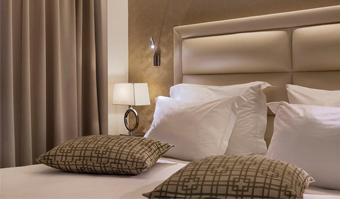 Eighty years of experience and close attention to even the smallest details of design and service enable the Yearim Hotel to provide an unrivaled atmosphere of intimacy, quiet, and relaxation. In clear, crisp mountain air, surrounded by evergreens on all sides, this environment ensures a truly tranquil vacation that will awaken the senses and leave you filled with renewed energy. Cancellation of regular season reservation 72 hours prior to arrival date free of charge. In July and August, and a week before the arrival date, a one-night cancellation fee will be charged. Deluxe BalconyThe sumptuous Deluxe Rooms are equipped with either a balcony overlooking a stunning view, or a private garden facing green vistas that invite guests to breath in the crisp mountain air. 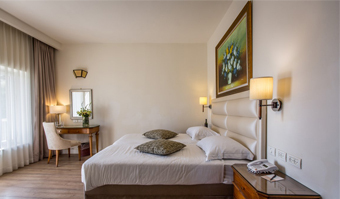 The rooms include free Wi-Fi, indulgent coffee-making equipment, cable television, a mini-bar with a range of quality beverages, and a private safe, guaranteeing a comfortable, unique, and enchanting vacation. Deluxe GardenThe sumptuous Deluxe Rooms are equipped with either a balcony overlooking a stunning view, or a private garden facing green vistas that invite guests to breath in the crisp mountain air. The rooms include free Wi-Fi, indulgent coffee-making equipment, cable television, a mini-bar with a range of quality beverages, and a private safe, guaranteeing a comfortable, unique, and enchanting vacation. Deluxe ShakedThe sumptuous Deluxe Rooms are equipped with either a balcony overlooking a stunning view, or a private garden facing green vistas that invite guests to breath in the crisp mountain air. The rooms include free Wi-Fi, indulgent coffee-making equipment, cable television, a mini-bar with a range of quality beverages, and a private safe, guaranteeing a comfortable, unique, and enchanting vacation. Standard AlonThe rooms include a mini-bar, private safe, cable television, coffee-making equipment, and Wi-Fi. Meticulous adherence to the highest hospitality standards ensure that guests experience a pleasant and tranquil vacation in the heart of Israel's natural environment. 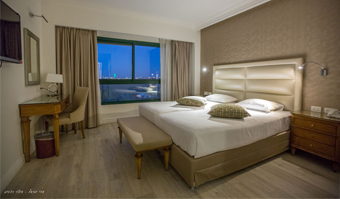 Superior AravaYearim Hotel's Superior Rooms are fully renovated with fresh new designs and the highest-quality finishing touches to ensure a pleasant, pampering stay. The rooms include a mini-bar, private safe, cable television, coffee-making equipment, and Wi-Fi. 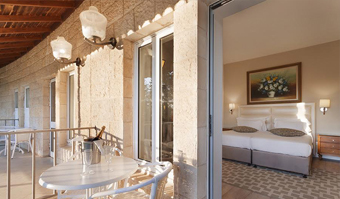 Meticulous adherence to the highest hospitality standards ensure that guests experience a pleasant and tranquil vacation in the heart of Israel's natural environment. 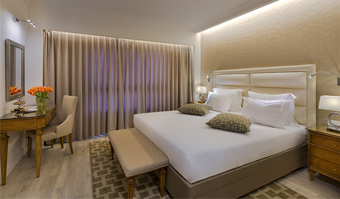 Superior Arava ViewYearim Hotel's Superior Rooms are fully renovated with fresh new designs and the highest-quality finishing touches to ensure a pleasant, pampering stay. The rooms include a mini-bar, private safe, cable television, coffee-making equipment, and Wi-Fi. Meticulous adherence to the highest hospitality standards ensure that guests experience a pleasant and tranquil vacation in the heart of Israel's natural environment.